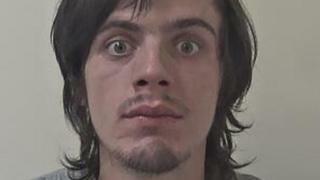 A man has been jailed for life for the murder of a homeless man in a dispute over drugs. Dion Hendry, 24, was living alongside Raymond Ward, 51, and other homeless people in a derelict former council property in Scunthorpe. Humberside Police said Hendry "inflicted 57 horrific injuries" when he attacked Mr Ward over the disappearance of two bags of heroin. His body was discovered at the Cliff House property on 9 July. Hendry was found guilty following a trial at Hull Crown Court. He was given a minimum term of 18 years in prison. Image caption Raymond Ward's family describe his death as "devastating"
Mr Ward's brother Jon Ward said in a witness statement read out in court that the effect of Mr Ward's killing on his family was "devastating". "The opportunity for us as a family to deal with Ray's issues has forever been destroyed by Dion Hendry," the statement read. "He has not only murdered Ray, but also taken away any hope that we may have had to heal our family."